With the Fantastic Four movie's impending release, a crush of merchandise has been sent to stores, including two series of action figures. Since no one needs two each of the main characters, choices must be made. In some cases - for instance, Mr. Fantastic - it's easy to choose one over the other. But what if it's not? Today we're going to help you pick a Human Torch. Johnny Storm lived his life on the edge - specializing in fast cars, pretty girls and extreme sports. Often walking the fine line between foolishness and fun, Johnny's reputation for risk-taking was nearly as legendary as his love for practical joking. Johnny had another, more serious side, too - as the best pilot and astronaut in the world. But no amount of skill could save Johnny from his fate as he piloted Reed's doomed space mission. Cosmic rays pounded Johnny's body, leaving him a human fireball - and his life as an adventurer forever changed. Now, hotheaded in a whole new way, when Human Torch isn't using his fiery power to aid the Fantastic Four, he's known to use it to pull a prank on his unsuspecting teammate, Ben Grimm. 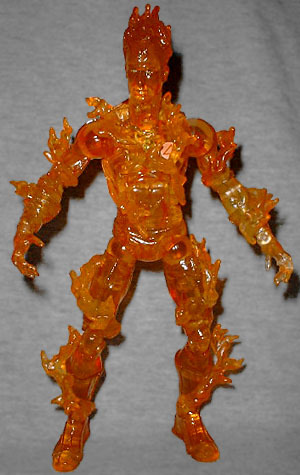 The Series 1 Flame-On Human Torch is cast in translucent orange plastic and features a light-up action feature: press the button on his back and a red light shines through his chest and head. It works well, but is totally unnecessary. Not only does the light remain fairly contained in a small area of his body, but you can see the battery compartment inside the figure. It would have been better if they'd just left the feature out. In his favor, the figure's sculpt is quite good. 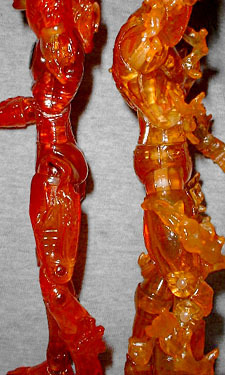 Although Torch is entirely translucent, ToyBiz didn't skimp on the detail. He's wearing the same uniform as the rest of the team, with all the piping and wrinkly details. The likeness of actor Chris Evans is decent, but not dead-on, which is fine, since nobody knows who he is anyway. The only paint on the figure is the 4 logo on his chest and a few apps in his eyes: minimal, but it works. Johnny moves at the neck, shoulders, biceps, elbows, gloves, wrists, fingers (four joints on each hand), torso, waist, hips, knees, boots, ankles and toes. There are large, swirling flames all over his body, but they've been sculpted in such a way as to not interfere with his movement. Really, the Human Torch is looking really good here. As a cool bonus, Johnny's got a display base. 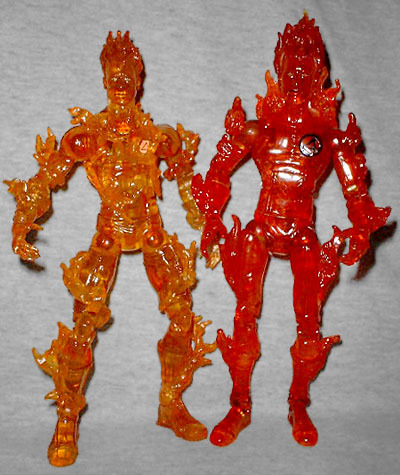 Yes, the Marvel Legends Human Torch had a flame base, as well, but that was a reused piece, while this is all new. 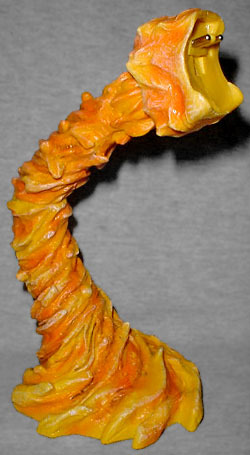 The base, a spiraling pillar of flame, plugs into Torch's back and lifts him slightly off the ground. There's even a point of articulation to give you more posing options. When the figure is attached, you can press a button on the base for light and sound action: Johnny shouts "flame on," the figure flashes briefly and there's a whooshing sound. Pretty unimpressive. Again, this figure would have been better if they'd left the action feature out. Luckily, the button on Johnny's back is not pressed when he's on the base, so you can display him without a constant, battery-draining glow. In Series 2 we got Flying Human Torch, a figure that at least has the benefit of not having any battery-operated action features. There's still a feature, but it's external, not internal. We'll get to that shortly. 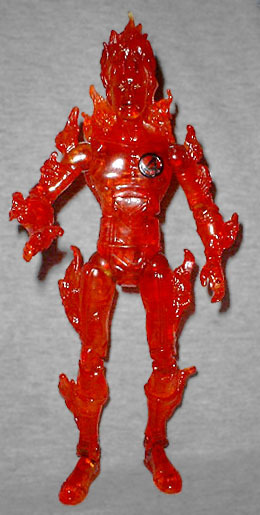 This Torch is cast in translucent red plastic, which helps set him apart from the Series 1 version. He gets black paint for his 4 logo and a few apps for his eyes. Articulation is just as good as before, with Flying Torch lacking only his light-up brother's individually dextrous fingers. Of course, since most of those points of articulation are ratchet joints, snapping into place as you move them, the range of poses is somewhat truncated. On the other hand, you don't have to worry much about them becoming exceedingly loose over time, so this Johnny Storm will be able to stand up for years to come. The sculpt is good, but strange - though you might not notice it alone, put the two Torches next to each other and the Series 2 version is much thinner. Johnny's been flattened like a pancake, run over by a steamroller... or maybe Ben just didn't look before he flopped down on the couch. Actually, it's more likely the same thing that plagued Johnny's sister Sue: an attempt to give human actors comicbook proportions that's gone awry and left them looking stupid. You can combine the two, it just takes work; and this would feel like a sideshow oddity even if this were a purely comic-based toy. Though Johnny seems fine from the front, he's way too skinny from the side. Other than that, the figure is fine. He's actually got a bit more detail than the Flame-On Human Torch, even if there's less surface area on which to sculpt it. The lack of paint apps doesn't mean that they skimped on the costume. There aren't as many flames skipping across his surface as there were on the other figure, but they still look good. Even the likeness is better. You might recognize Chris Evans as the guy from Not Another Teen Movie - I'd tell you he was also in Cellular, but I think more people attended my bar mitzvah than saw that flick. The Human Torch "flies" thanks to what is possibly the goofiest accessory of all time. It's basically a big red gun, sized for a child's hand. Johnny fits into a clip at the barrel: squeeze the trigger and the end of the thing spins, twirling Johnny along with it. 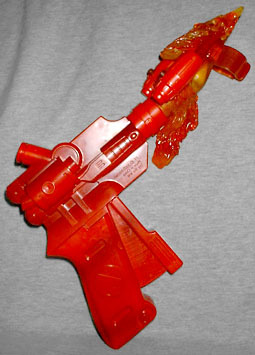 The clip is concealed by some nice flame detailing, and there are two fiery missiles that fire from above the figure's shoulders, but this thing is probably bound for the landfill. So which Human Torch should you get? When I picked these up, I thought Series 2 Flying Human Torch would be the easy recommend, but Flame-On Human Torch isn't as bad as I thought it would be. The light-up version has more realistic proportions and a better accessory, but the scrawny red one has a better likeness and no silly action feature. Screw it: buy them both, and customize the one you like least into a flamed-off Johnny Storm. Heck, they're both better than a reused Spider-Man body painted red.